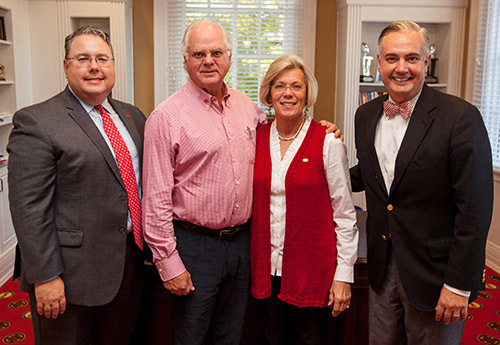 WKU Philanthropy announced Friday morning (Oct. 26) that Kristen T. and Phillip W. Bale of Glasgow have made a gift of $250,000, through a combination of an outright gift and a provision in their estate plans, to establish the Kristen T. & Phillip W. Bale Leadership Excellence Fund to benefit the WKU Center for Leadership Excellence. The Kristen T. & Phillip W. Bale Leadership Excellence Fund will support the mission of WKU’s Center of Leadership Excellence to serve as a resource that advances the understanding and applications of leadership in contemporary society. WKU recognized its top volunteers Thursday night (Oct. 25) at the 18th annual Summit Awards. Distinguished Service Medals to recognize the service of the University’s top volunteers were presented to Dion W. Houchins of Bowling Green, Deanna L. Mills of Woodstock, Ga., and Heather L. Rogers of Nashville, Tenn. The Summit Awards were presented by the College Heights Foundation, the WKU Alumni Association and WKU Foundation. The event was held at the Augenstein Alumni Center as part of Homecoming activities.